Recently, we gave a workshop to several dozen CEOs who had less than stellar years. They had their strategic plans in place and tactical actions laid out. Now they were ready to see how their strategies were working for them — or not. While they could each explain why results were not as strong as expected, what began to dawn on them during our workshop was that part of the problem was their strategy. In each case, it needed to be reviewed and reworked in order for their businesses to get going again. 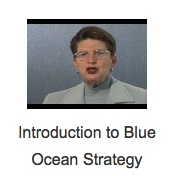 You might need a Blue Ocean Strategy. As trained Blue Ocean practitioners with over 350 workshops and dozens of client engagements under our belts, we help companies see how a new approach — Blue Ocean style — can lead them to find new untapped markets awaiting their solutions. Exploiting these untapped markets then leads to business growth, the ultimate goal. 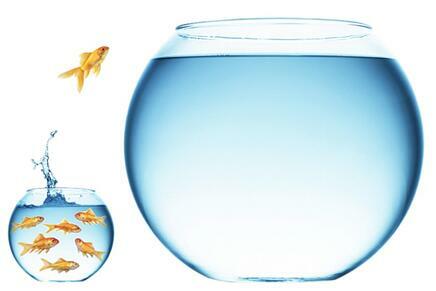 What are the most important Blue Ocean Strategy tools? Strategic Canvas: The first step in evaluating your current investments and competitive positioning (your value curve) is to use a strategic canvas. 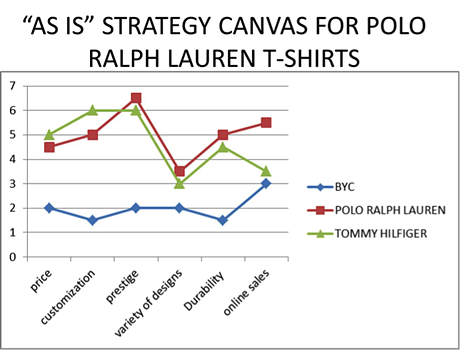 The example below is for Polo Ralph Lauren t-shirts. When compared to its major competitors, Polo was very much the same as Tommy Hilfiger. The only sector where they were more highly invested was in online sales — or at least that's what they thought. If they were going to be more than “just another designer t-shirt,” they were going to have to Eliminate and Reduce some things and Create and Raise others. From this would come an entirely new positioning and a strategic canvas that would reflect that shift in investment, focus and point of difference. Who are your nonusers: This tool represents a way to think about your potential new markets: those nonusers awaiting your solutions. Second-tier nonusers: These are people who consciously refuse an industry’s offerings — buyers who have recognized these products or services as options to fulfill their needs but have voted against them. Think of them as people who never went to the circus — until Cirque Du Soleil came along. Or those who would rather walk than take a taxi — Uber is now making a fortune off of them. And Airbnb is capitalizing on nonusers of hotels. Who are your “refusers?” How could you open big, profitable markets by capturing them? Third-tier nonusers: Third-tier nonusers are furthest from the existing market. They are nonusers who have never thought of a market’s offerings as an option. These are “unexplored” nonusers. For example, how could Skype pull in new users who have never tried or never even considered trying their video and calling options? Who might be a perfect target of nonusers for your company? As you consider the different types of nonusers consider their common needs. Regardless of what type of nonuser people are, there are commonalities they share that could create an entirely new market space for you. This is how you create a Blue Ocean of new demand. Try not to think niche. Think broad. Visual Exploring: This is among the least discussed part of Blue Ocean Strategy. As anthropologists who specialize in helping companies change, we at SAMC know that it is hard to ask nonusers: “What do you need?” Few people would thoughtfully tell you what they really need, the "go-around" solutions they have created or why they aren’t coming to you to solve their problem. That's why we created our own Anthropology Toolkit to help our clients “go exploring.” How can you better “see, feel and think” in new ways if you are stuck in your office? Take your staff, preferably at management level, out into the field to do actual observational research. You need to "spend a day in the life of your customers” and watch how they are solving their problems. Are they doing this by using your product? Hang out and just watch, listen and see where the pain points emerge. Conduct culture probes. Give nonusers images or artifacts and have them build stories around these items that describe how they are solving a problem. It's very helpful to bring nonusers together (or you can conduct individual sessions) because they can help you build a prototype of a solution for them, a product or service that could really help them solve an unmet need. Storytelling. These can be very powerful sessions where people tell you stories about how they get things done. From their stories can come important insights into their unmet needs, which can then lead you into new untapped markets (think Uber, Airbnb). Observational research. Watch people doing things, from hanging out in malls to eating in restaurants to working on the shop floor to selling clients a product. Once you start observing, all sorts of great ideas -- and those unmet needs -- will emerge. Four Action Framework: This is a very powerful way to re-focus your strategy and re-think your business strategy (not redirect your expenses). Remembering the strategic canvas (the 1st tool above), is designed to help you redirect your business to reach nonusers or new markets, what will you “eliminate” or “reduce”? What will you “raise” and most importantly “create” in order to add value + innovation? This is about re-focusing, re-packaging and re-imagining. 6. Buyers Experience Cycle: This tool is concerned with where and how people and companies search for a solution to their problem. From left to right on the horizontal axis (below), it maps out where and how they purchase a product, how delivery takes place, how they use a solution/product, how they find/buy supplements or maintain it, and how they dispose of it. Along the vertical axis are the key areas that you should consider to add value innovatively. Curious? Watch this video on how to rethink your strategy. Or perhaps you would like us to conduct a workshop for your organization, in person or via Skype. Give us a call at 914.245.1641 or email us: info@simonassociates.net.